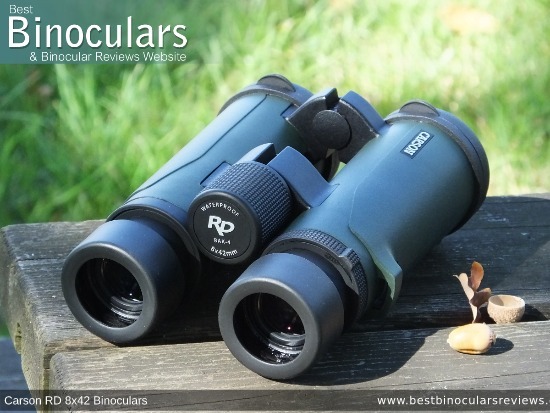 Consisting of five roof prism models, the Carson RD-Series binoculars are low costing, mid level instruments (MSRP of between $105-$245) that offer a good selection of high performance components, but at a price that should appeal to most budget conscious buyers. The models within the series include a compact 8x26 (RD-826), a mid sized 10x34 (RD-034), a 10x and 8x42 (RD-042 and RD-842) and then a large 10x50 (RD-050). So as you see the Carson RD-Series is fairly comprehensive and thus will cater for a wide range of uses and interests. Carson Optical sent me a couple of the models within the RD-Series to take a look at and so to start with, I decided to review the most popular 8x42 configuration. All Carson RD-Series binoculars use roof prisms and thus have straight through barrels with the ocular lenses directly in line, behind the objectives. They also feature an open bridge body design, which I generally like and really liked on these. The main reason for this is that not only was the Carson RD-8x42 comfortable to hold and well balanced when I held them up to my eyes, but the gap in between the barrels and the two hinges made for a secure place to hold onto them whilst walking about. You see I often prefer not to use a neck strap and even when I do, there are occasions like when climbing down a steep incline or over rocks, that having a binocular swinging around your neck is not ideal as it could easily swing and smack into that rock. 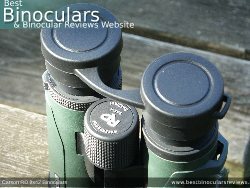 So for added security it is great to be able to hold onto your binocular securely like this. As with the vast majority bins made these days, the Carson RD's have a rubber amount covering almost all of the chassis underneath. 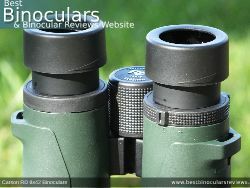 Indeed the only parts showing on these are the two hinges and small sections of the eyepieces that are exposed when you twist up the eye-cups. 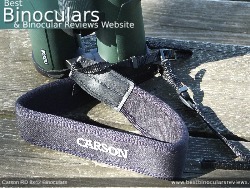 The rubber that Carson have chosen to use on these is particularly hard and relatively thin. This looks good and most certainly has less chance of perishing than those that use much softer rubbers. However on the negative side, the surface is more reflective (so offers less camouflage), provides less impact protection and less grip as well. Carson have countered this to some extent with the very fine texture, that acts a little like extremely fine sandpaper to increase the grip and I guess reduce reflectivity as well. Under the rubber the Carson RD 8x42 binoculars have a Polycarbonate plastic frame that forms the body shape and protects the optics and mechanisms within. This is perfectly normal at this price level as the are cheap to manufacture, lightweight and reasonably strong. 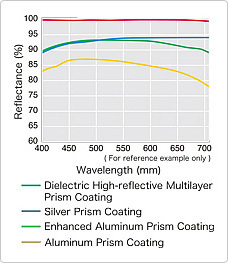 For those who are interested, higher end instruments will usually use magnesium, or sometimes aluminium frames, that provide just that bit more strength and I do believe especially in the case of magnesium, expands and contracts less due to temperature changes and thus offer more security against the optics inside being affected by this. However unless you are really planning on exposing yourself and your optics to the extremes, this should not be much of an issue for you. I just added it as many people ask what the difference is between cheap and more expensive binoculars and this is one of them! 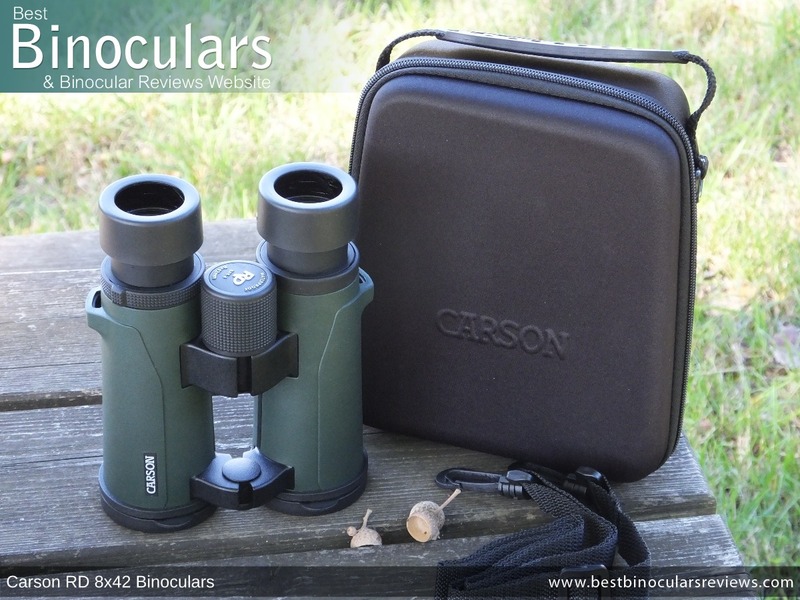 Good to know that the Carson RD-Series binoculars are fully sealed and thus waterproof. Remember, this is not only good for those people who not afraid of the rain, as being hermetically sealed means that they are also protected from dust in dry conditions as well. The twist-up eye-cups on this instrument are about as comfortable as most others out there, so not too much to expand on here. The twisting mechanism on both cups on my sample was extremely smooth, in fact I would probably have preferred there to be a little more friction. This is because at any position other than fully extended or retracted, if you apply a reasonable (but not excessive) amount of force, they begin to twist down. Thus if you have the at a mid point and push them reasonably firmly against your face they do give and you find that your eyes get closer and closer to the oculars. However I have to point out that I did have to use a little more force than what I would normally use when placing a binocular against my face. But if you knock them, your setting will move. Also just keep in mind that most people will either have them in the fully extended (where they click into place) or fully retracted position, where this is not a problem. So whilst this is not ideal, for most users, I don't seeing it being more than a minor point that I needed to bring to your attention. At this price range, the focus wheel on these is truly up there with the very best and is in my experience is as good as that which you find on many, if not most mid to high end instruments. These three features as well as the low geared mechanism (takes just over two turns to go from Min. to Max. focal distance) means that I found it super easy to very accurately focus in on an object even when I tested them with gloves on. This can be an important point to keep in mind if you plan on going out in winter. The diopter adjustment wheel that you use to calibrate these Carson RD 8x42 binoculars is fairly typical, apart from the fact that it has two fairly large tabs on both sides of the ring. So whilst I like it that they make it super easy to adjust your setting, It is a little overkill and makes accidental movement of your preferred setting more likely. 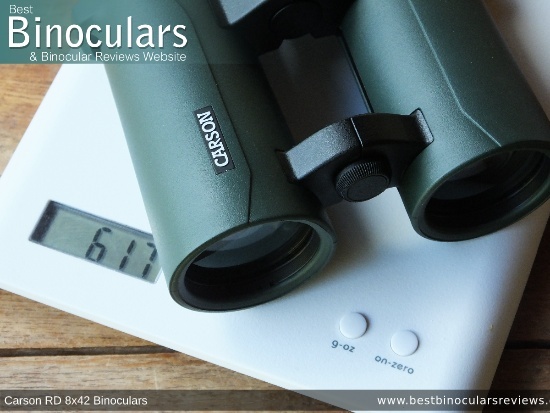 I just had to recheck the official weight because as you can see, weighing in at 617g / 21.8ozs these Carson RD binoculars are up there with the most lightweight 42mm binoculars on the market. Here I think the combination of a lightweight polycarbonate chassis combined with the open bridge design has really paid off, making these an ideal choice if weight (or lack of it) is an important aspect that you are after. 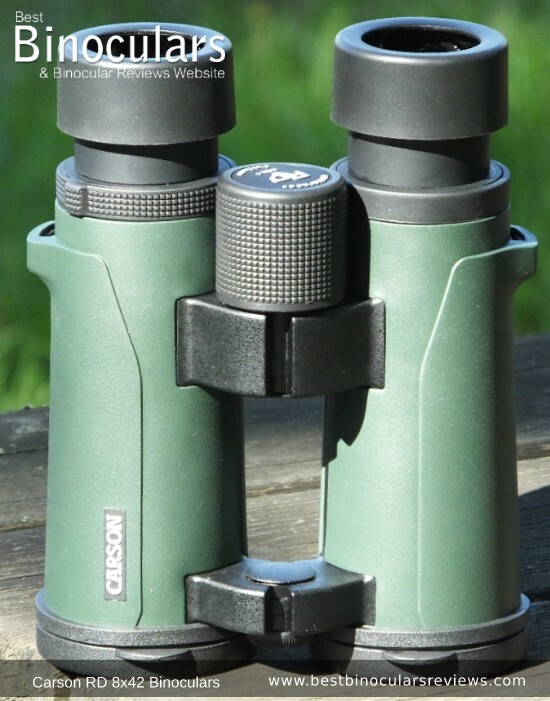 The dimensions of the Carson RD-842, with the eye-cups twisted in and the hinge fully open is as you can see from the table above very regular for a 42mm binocular. 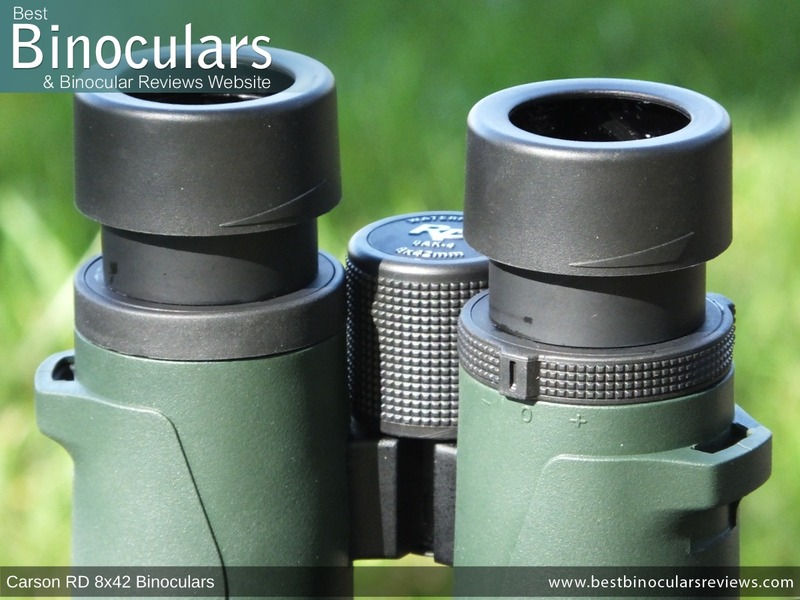 The two thin hinges that span the barrels on the Carson RD 8x42 binocular look to be made from an some sort of metal ally, but most importantly they look and feel very robust and thus should keep the two barrels in perfect alignment, unless you were extremely rough on them! The hinges on my sample opened and closed perfectly smoothly and the level of resistance was just right. By this I mean it was not too hard to open and close, but at the same time would remain at your desired IPD (Inter-Pupillary Distance) setting. Carson don't state the 'official' IPD range on these, but I measured it to be from a minimum of 5.8cm up to 7.7cm which is fairly typical for a 42mm roof prism binocular. These Carson RD-Series binoculars are "tripod adaptable" - by that I mean they make it really easy for you to fix them to a tripod. All you need to do is remove the dust cap on the front hinge by unscrewing it. 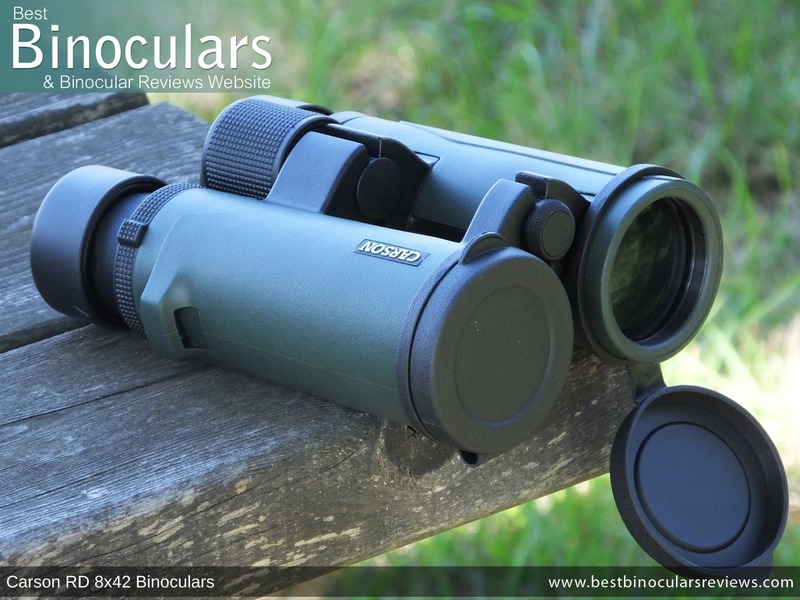 Then you can simply screw in a standard binocular tripod adapter. These adapters then fix to your tripod head and you are good to go. There are a few benefits to this, including making it easier to align your eyes to the lenses and potentially you can get a higher image resolution. 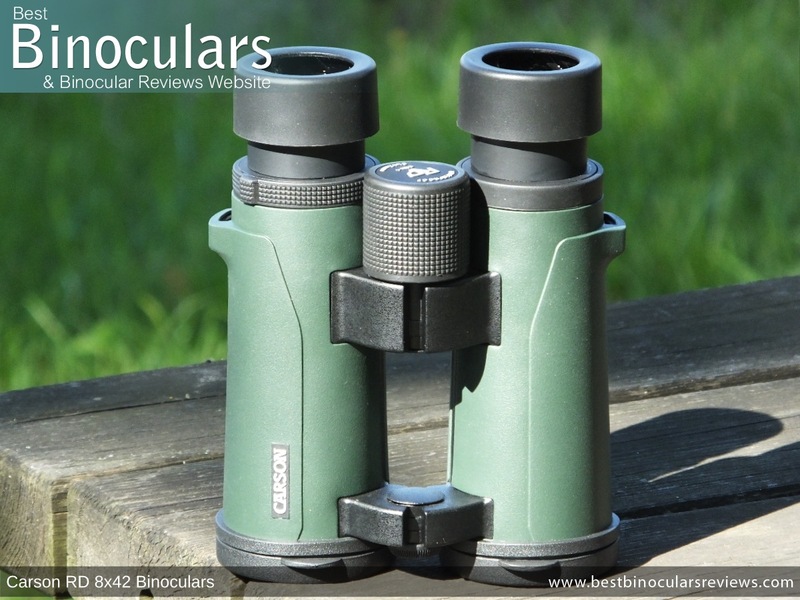 For more on this and to compare the ocular lens size on these Carson RD Series 8x42 binoculars with others: Ocular Lens Size in Binoculars. Likewise in regards to the lack of details supplied on the arrangement and composition of the elements within the objective lenses, so apart from stating the obvious in that they have a diameter of 42mm, all I can add is that they are set back to a depth of about 8mm. This is is a few millimeters less than some, but I feel still offers the lenses and adequate amount of protection, keeping out of the way of light falling rain, dust and from being scratched when placing the instrument down on the barrel ends without the lens covers attached, which you shouldn't do anyway. 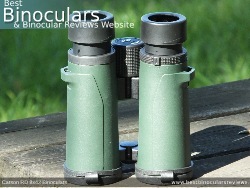 These Carson binoculars use roof prisms made from BaK-4 glass to correct image gets inverted as it passes through the system. 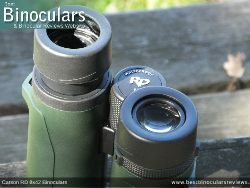 This is good as there will be a few within the low cost price range that may have the less desirable BK-7 glass prisms. 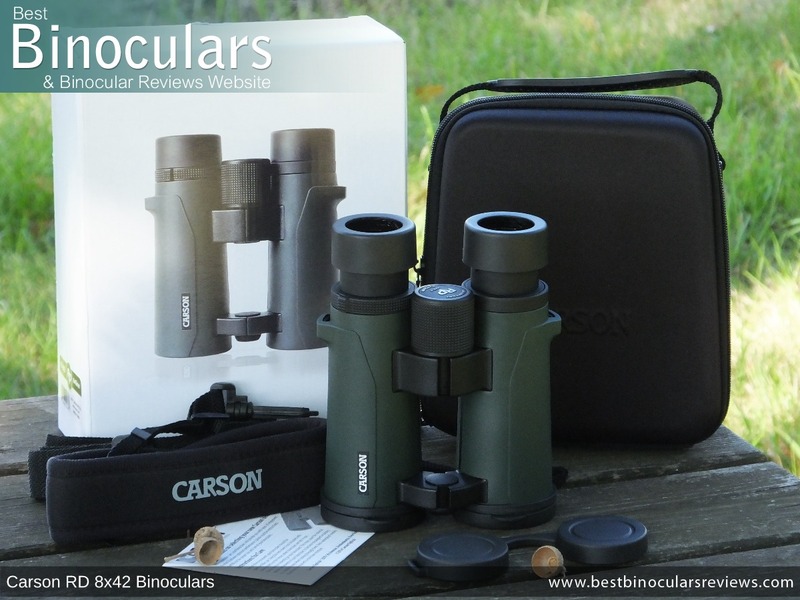 Carson RD 8x42 binoculars are Fully Multi-Coated, these exact words and in that order are important to look for when shopping for binoculars, especially at these lower price ranges. This is because many will boast that they are Fully Coated or Multi-Coated, however this only means that either all lens surfaces have been single coated or only some of the lens surfaces have been multi coated. Whereas Fully Multi-Coated tells us that every lens element throughout the system has been multi layer treated which does make a big difference in both quality and brightness. 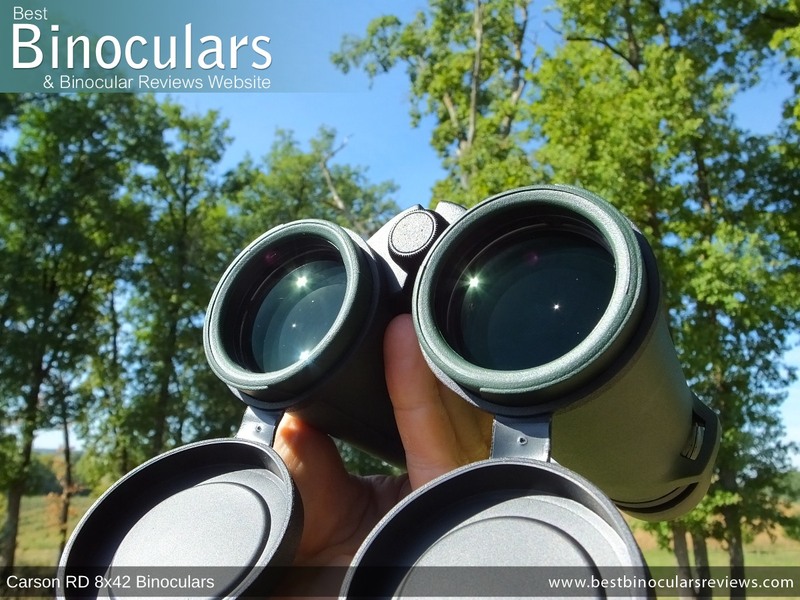 For more info: What To Look For When Buying Binoculars & Anti-Reflection Lens Coatings. 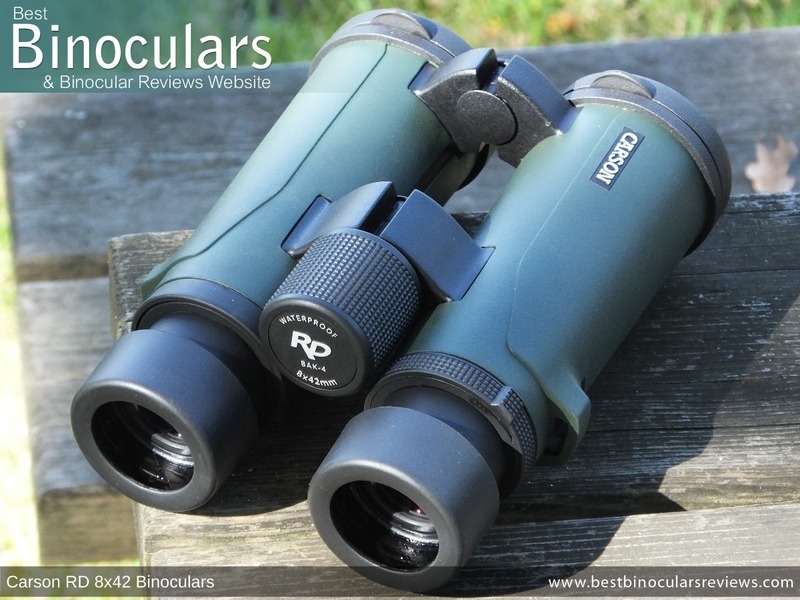 The roof prisms on the Carson RD Series binoculars are silver mirror coated which usually means that they have a reflectivity of between 95% to 98%, which is good and whilst not as reflective as dielectric coatings, at this price this is about as good as it gets.# and much better than some at this level that will have aluminium mirror coatings. 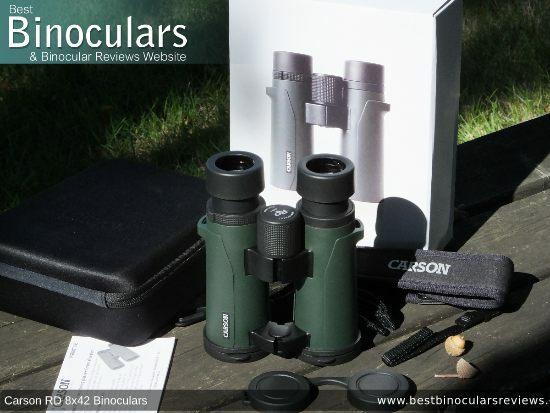 So as you can clearly see with the comparison table below, these Carson binoculars do well within their price range,although it would have been even better if they could have managed to have added phase correction coatings to the prism which would just raise the image definition just that little bit more and take them up above the crowd in this price range. The 8x42 Carson RD has an angle of view of 7.1° or, to put it another way the width of the view that you see at 1000 yards away is 371ft wide. 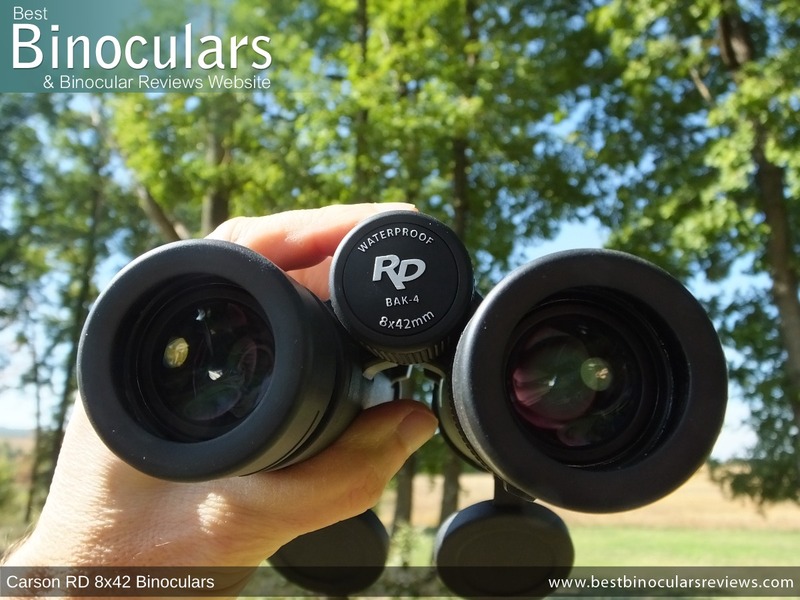 The 17mm of eye-relief is good and whilst not quite enough (18mm) to make it onto my list of binoculars with long eye-relief, it should still be more than enough for almost all users who wear glasses to get the full view. 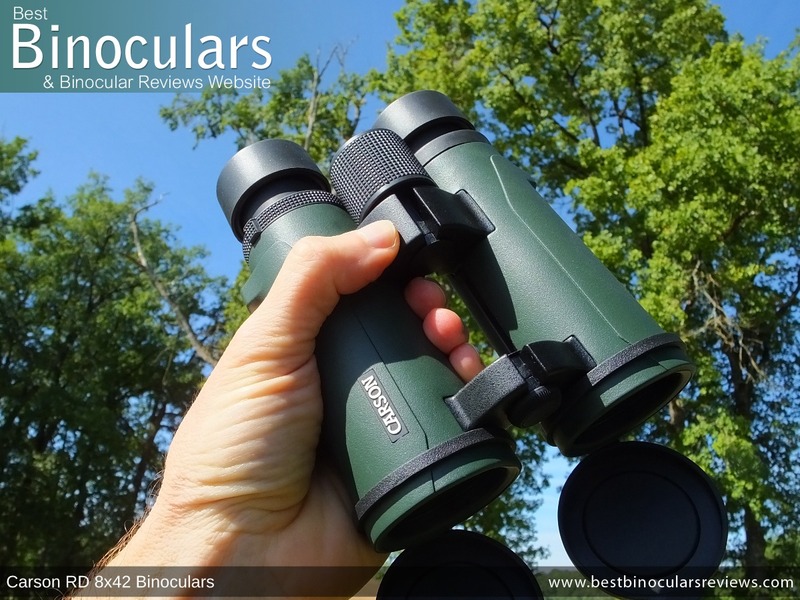 At 9.8ft, the minimum close focus distance for an 8x42 binocular is good, but not excellent (6ft or under). As a point of interest, I measured the closest distance that I could focus on my sample Carson RD 8x42 binocular to be 190cm / 6.2f which is much closer, although at that range you do get some convergence/cross over between the the left and right sides of the view, which is one of the reasons why many manufacturers quote a distance that is more than what is actually possible. 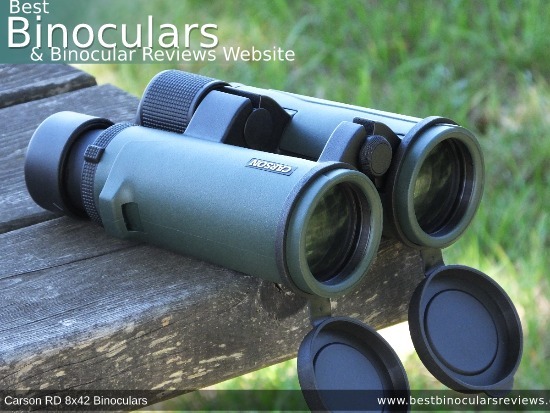 So even though you only have to pay $40 more, the view through the Carson 8x42 RD Binocular is perceptibly better than your average sub $100 instrument. However you have to spend double the amount to get a small difference and then if you want a very noticeable improvement, you have to pay 5x-10x what these cost. Compared to my alpha 8x42 and mid range 8x42 benchmark binoculars, the Carson RD 8x42 did about as well as I expected. So whilst I could see a better and brighter image in my alpha, they were very close to the mid range benchmark in all but very low light conditions. Considering that my mid range benchmark costs almost double these, this is good and thus I can say that these do very well in this area when compared to any 8x42 in their price bracket. Both the contrast and color of the image I saw through my sample looked normal. 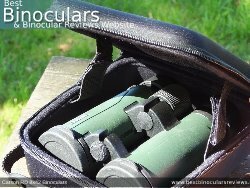 This is good as some lower cost binoculars can have a yellowish tinge to the view or lack contrast, whereas this was not the case with these. Considering that these do not have ED glass lenses which are supposed to reduce the aberrations that cause color fringing, I was impressed to see just how little fringing that I could see through this Carson binocular. 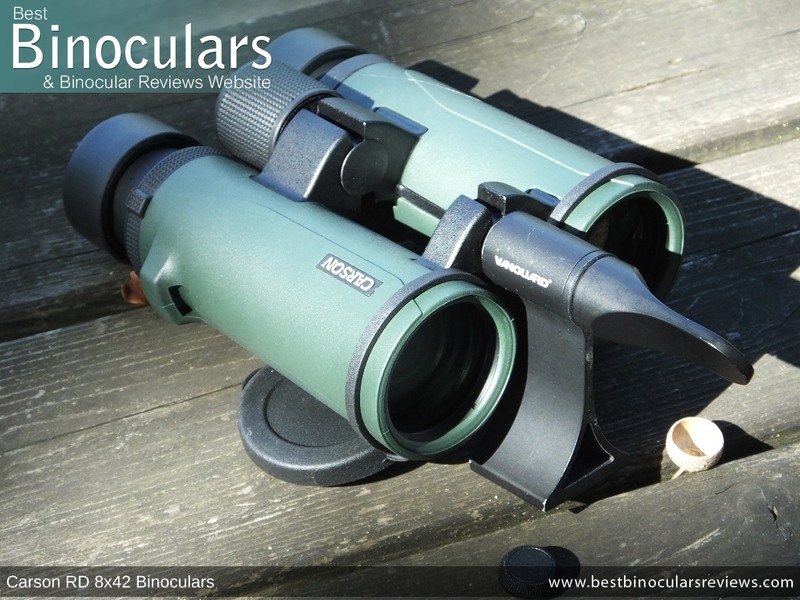 Indeed I would go as far as to say they were no worse than many low and even mid cost binoculars that do have ED glass and this is another example that I have found where unless you move up into the higher end categories, not having ED glass is not an issue. For more read my article that explores the question Are Binoculars without ED Glass Any Good? I never noticed any irregular distortions in the view that can occur like bending or curving of the image. Once focused on an object, image sharpness remained consistent from the center of the view right up to the edges. The level of blurring right at the edge of the view was minimal and no more or less than what I would expect to find at this level. Theses Carson RD 8x42 binoculars are supplied with the usual arrangement of accessories that includes a carry case, neck strap, lens covers, rain-guard and a cleaning cloth. All of these are typical, perfectly functional and well within what I would expect to find at this price range. The semi rigid construction not only looks great but certainly improves the level of protection offered to the instrument inside. The case comes with it's own detachable shoulder strap and it also has a very comfortable hand strap that I really like. Inside there is a separate netted pocket that is perfect for storing your cleaning cloth and perhaps a few small personal items. The Carson binoculars also fit perfectly inside and can be stored with the eye-cups extended which is all too often not the case and so whilst a very small thing, is one thing that really annoys me. Neck strap is well padded and comfortable. Could be improved with a more "grippy" material on the underside to stop it slipping about on your shoulders. A quick release system is also something that I look for but is sadly absent on these. All Carson RD Series binoculars come with their "No-Fault Warranty" and whilst they don't stipulate a time frame, I assume it is a lifetime? 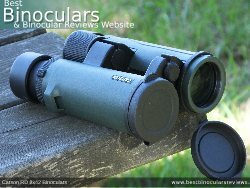 So whilst you only have to spend $40 more, the Carson RD-842 binocular is for certain better than your sub $100 instrument. However you have to spend double the amount of these to get a small improvement and then if you want a very noticeable improvement, you have to pay 5x-10x what these cost. The twist-up eye-cups turn just a little too easily for my liking. So whilst twisting them up is no problem, they do have a tendency to twist down again if you don't have them fully extended. 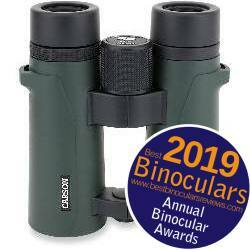 Field of view is adequate, but there will be some that may want more from an 8x42 binocular.